Technology: Compression Molding Services are plastic and rubber forming services by which raw materials are placed into heated mold cavities. The materials soften, the molds close and pressure is applied to force the materials to conform to the mold cavity shapes. Compression molding is a high volume production process. 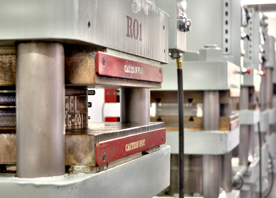 Compression molding relies on preforms of the material which are placed into the mold prior to its closing. The preforms are roughly the same volume as the cavity of the mold but slightly larger to ensure complete fill. The mold closes and under heat and pressure the material flows through the cavity with the overflow spilling into special grooves cut into the mold for that purpose. Compression transfer molding is a variant of compression molding. It uses an additional chamber above the mold to melt the preform before injecting it through runners and gates to the mold beneath. It generally creates less flash around the part than ordinary compression molding. Advantages: Compression molding services are generally less costly than injection molding services.